Here is your chance to be ostentatious! 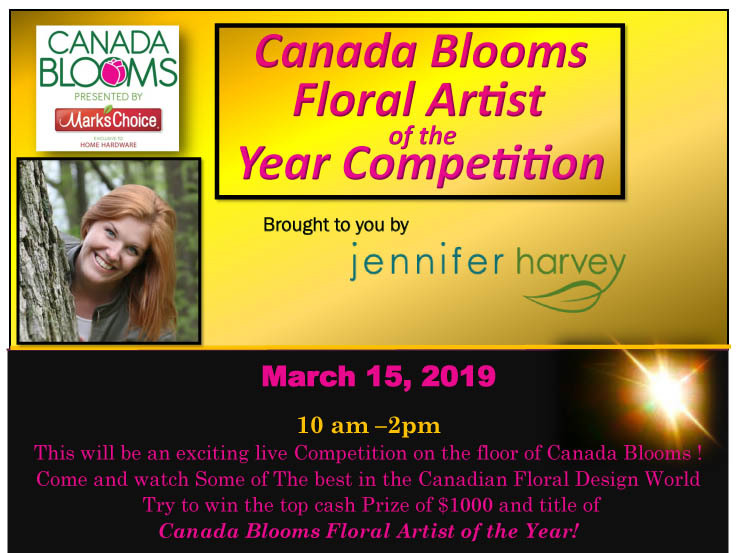 Canada Blooms is excited to be able to introduce the CANADA BLOOMS FLORAL ARTIST OF THE YEAR presented by Jennifer Harvey. on the floor, design challenge. Competitors will be given the same materials and a time limit of 4 hours to get as creative as they can. Contest is open to up to 20 floral designers — amateur and professionals, on a first come, first serve basis. Entrants from outside of Canada are welcome. Fee for entry is $150, paid via the Canada Blooms Ticket page. 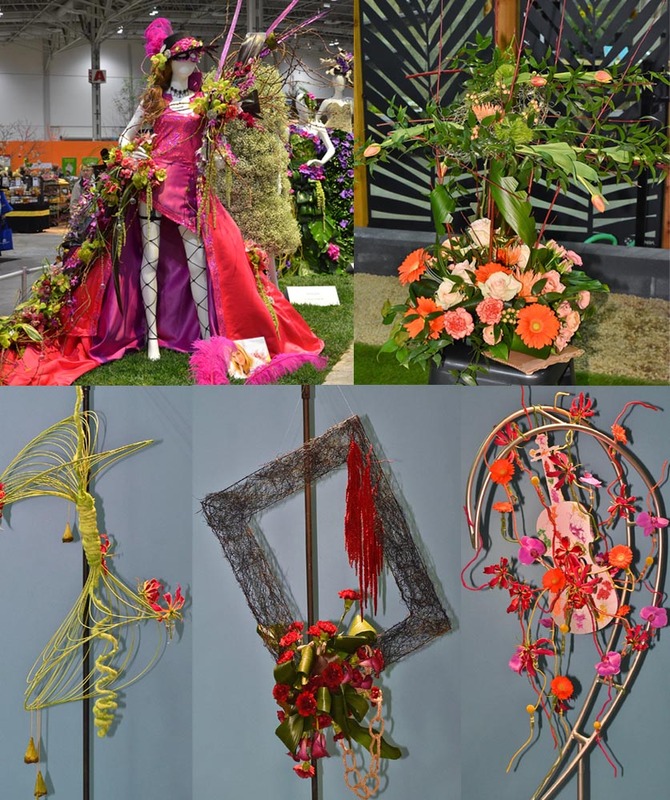 Competition will take place on the Canada Blooms Festival Floor from 10am-2pm. While designing Canada Blooms will be open to the public. Competitors must sign a release form at registration stating that Canada Blooms has full rights to all images in order to participate. All design materials (hard goods, flora and fauna) will be given in a surprise pack the morning of the competition at your station. Competitors must use a minimum of one of each fresh good item provided in their design. Competitors must bring their own tools to work with. No electricity is provided (no hot glue), cold glue is allowed. Piece must be able to stand alone, securely on a 2 ft x 2 ft x 3 ft (high) set (pillar like). Material may ‘spill off’ or hang down the set. Competitors may not receive any outside coaching. Once design is complete, or time is finished, competitors will place their designs on the designated set for judging. Competitors must then clear the area in order for judging to commence. Competition begins at 10am. Each contestant must arrive no later than 30 minutes prior to start time to register, to be given a table number and work area allotment. Each contestant, at that time, may look at the supplied material but if touched before start time they will be disqualified. There will be a 45 minute, 30 min, 15 min, 5 min, 1 min and 10 second warning. Work area must be cleaned and table will be removed before judging begins. Top prize is $1000 cash and title of Canada Blooms Floral Artist of the Year 2019. Entrants who participate, may sign up for the Jennifer Harvey Floral Workshop with Neville Mackay on Saturday, March 15 from 10am-3pm (lunch included) at a rate of $375 ($500 for workshop alone). All Canada Blooms Artist of the Year entrants as well as Floral Alley entrants are invited to the Floral Awards Ceremony in the Wine Lounge, Friday, March 15, 2019 at 6:00 p.m. to recognize all the winners. Go to Canada Blooms Ticket Page to pay fee and complete your registration.